....The SCRIABIN CODE is many interesting codes, not just one. This CD is one of the really important examples for the transformation of contemporary music into a great vehicle for modern group jazz improvisation. The concept of this project makes it a dramatic and exciting experience with Asli playing the originals and the SCRIABIN CODE improvising. That’s jazz right there. Its creative and forward-facing. 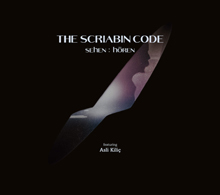 ....The SCRIABIN CODE is a musical correspondence between classical virtuosity and jazz improvisation. It means complete understanding of all music that was before. Every piece has it’s own sound. THE SCRIABIN CODE found an essential part of the CODE: the sound, your own sound in it, going forward and playing it like it is yours. Play the originals like they were standards. That’s it, you cracked the CODE!